With more than 13 million of its contactless cards in circulation in the US in 2006, Oberthur Card Systems has produced more than 36 percent of the estimated 36 million contactless banking cards in the growing United States market. Oberthur also expects and is ready for an increase in the number of cards requested in 2007 because of rapid adoption and deployment programs. Contactless cards speed up the purchasing process for the consumer and the vendor since the technology allows the transaction to be completed in half the time it would take for a cash or standard magnetic stripe transaction. In the U.S. quick service restaurant (QSR) market alone, where transaction speed is critical, there was $143 billion in transactions in 2006. CardTech SecurTech 2007–SAN FRANCISCO–With more than 13 million of its contactless cards in circulation in the US in 2006, Oberthur Card Systems holds a solid #1 in this growing market. At the end of 2006, the global smart card leader has produced more than 36 percent of the estimated 36 million contactless banking cards*. Oberthur’s high volume manufacturing and personalization facilities throughout the U.S. make it well positioned to handle the large volume requirements of banks and financial service companies. Americans are embracing contactless payments with statistics showing that contactless cards quickly become the top option for shoppers — trumping conventional cards. 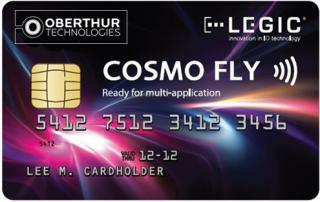 Aberdeen Research Group estimates that by 2011 the total contactless cards in the U.S. market will be 109 million cards. Oberthur points to contactless card initiatives underway in 10 major sports stadiums as well as a number of fast food chains; as high profile showcases for the benefits of contactless technology. Contactless cards speed up the purchasing process for the consumer and the vendor since the technology allows the transaction to be completed in half the time it would take for a cash or standard magnetic stripe transaction. In the U.S. quick service restaurant (QSR) market alone, where transaction speed is critical, there was $143 billion in transactions in 2006. Contactless cards are also being used in movie theaters, gas stations and convenience stores throughout the U.S.
With sales of 524.0 million Euros in 2006, Oberthur Card Systems is one of the world’s leading providers of card-based solutions, software and applications including SIM and multi-application smart cards as well as services ranging from consulting to personalization. Mobile Communications: 37% of 2006 revenues, with open and interoperable solutions based on Java™ technology. Close to its customers, the company benefits from an industrial and commercial presence across all five continents. Listed on the Euronext Stock Exchange (ISIN: FR0000124133) since July 2000, Oberthur Card Systems is a subsidiary of the François-Charles Oberthur Group.